The pathSCREENER is a genetically encoded screening assay and combines barcoded pathway activity assays with multiplexed genetic interference screening to deconvolute gene networks in mode-of-action studies. 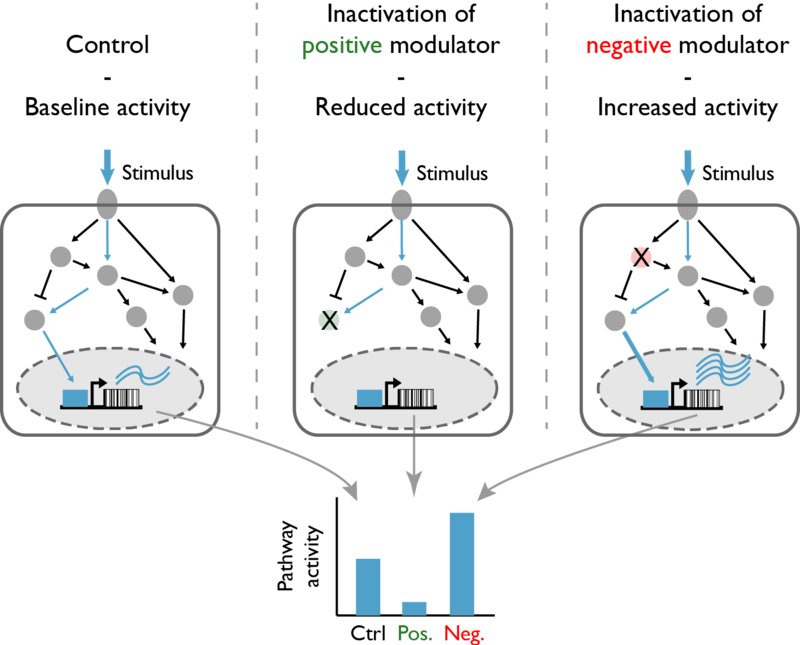 For example, a neuronal activity reporter that expresses unique RNA molecular barcodes can be coupled to a pooled shRNA or sgRNA/CRISPRi library to identify targets, which modulate neuronal activity. In such a screening approach, inactivation of a positive modulator of activity-dependent neuronal signaling decreases the neuronal activity reporter (Fig. 1, center panel). By contrast, inactivation of a negative modulator of activity-dependent neuronal signaling increases the neuronal activity reporter (Fig. 1, right panel). Applying the pathSCREENER assay allows identify novel targets and to deconvolute gene networks impacting on brain disorders (Fig. 2).